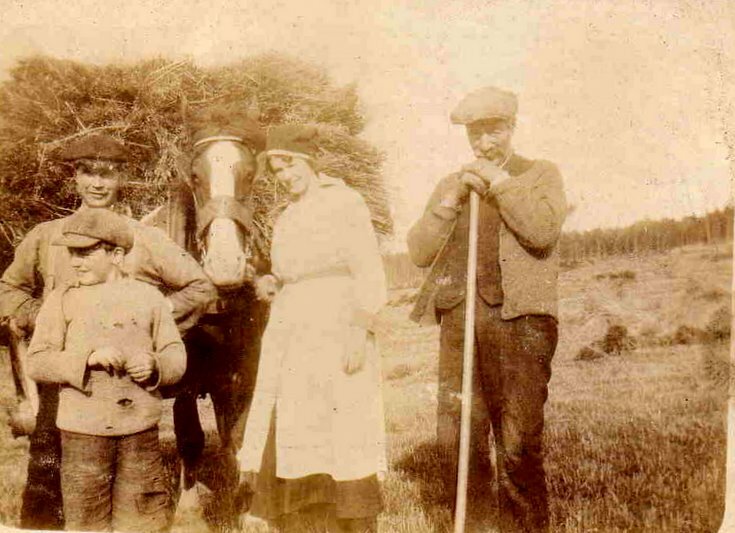 So, who are the folk above, shown in a photograph found in a family album by Herbert MacKenzie? See also image 973. It looks like a harvest of oats on the cart. Hello Herbert , I know there were Thomsons at the Hillocks Farm Keig , they moved to Parkhead , Tullynessle . There were also a family of Keirs .. same family as Ladymill , Craigievar I believe . My dad & mum Jimmy&Jean Duncan moved into the Hillocks when they married in 1945 , my grandfather John Duncan of Redhouse farm Tullynessle rented the Hillocks farm from Lord Forbes and my dad bought the farm from the Forbes estate in the 1950s .